The Skoda Yeti has suffered in recent years, thanks to stiff competition and an Australian fascination with SUVs. The 2017 Yeti has some interesting additions that may be able to reverse that trend and freshen line up. This model made its debut here back in 2009 and has been on sale consistently since 2011. There was a significant update in 2013, but this is essentially still a first generation car. Let’s take a closer look at what the new Yeti has to offer. The Skoda Yeti is powered by a 1.4 litre four cylinder turbocharged petrol engine that generates 110kW power and 250Nm of torque. Skoda claims a combined fuel efficiency of 9.1L/100km and stop/start technology is fitted as standard. There is more standard equipment, including: push button start, daytime running lights, automatic halogen headlights, rain sensing wipers, a rear view camera, cruise control, keyless entry, front and rear parking sensors, privacy glass, front fog lights, a 6.5” touchscreen, Bluetooth connectivity, audio streaming, eight speakers, metallic or pearl effect paint and a complementary ‘Navi Pack’ that adds Satnav. The Skoda Yeti has received a five star ANCAP safety rating every year since 2011. Some of the standard safety features, include: seven airbags in total, front and rear curtain airbags, a drivers knee airbag, hill hold assist and a pair of ISOFIX anchor points. An additional ‘Tech Pack’ is also available for an additional premium of $2,100 that boost the specifications, it includes: a DAB+ digital radio, a 12 speaker premium sound system, Android Auto and Apple CarPlay compatibility, LED daytime running lights, LED tail lights, bi-xenon active cornering headlights, headlight washers and semi automatic parking. The Yeti is a Van? The Skoda Yeti has a unique party trick that makes it a flexible and versatile choice. This five seater has tons of legroom and headroom, with loads of cabin storage solutions, such as map pockets, door pockets, a fold down center armrest and cupholders. However, storage gets even more extreme when you fold down the 40:20:20 rear adjustable seats entirely. The rear seats can be flipped, removed and locked flat on sliding rails using no tools. The boot space is expanded from 321 litres up to an astonishing 1,485 litres with the seats folded and up to 1,664 litres if they are removed. To aid in boot storage, there are luggage hooks, tie down straps, more compartments and storage poles. Under the boot floor is a space saver spare, there is a 12v outlet and a pair of lights, one of these is actually a LED torch, a nice touch. 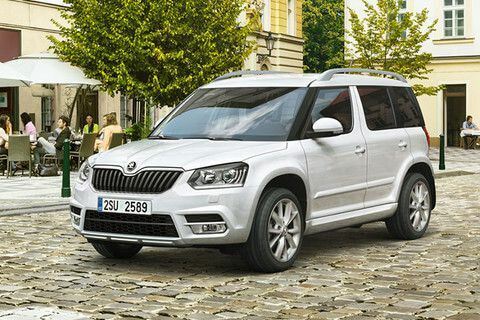 If they are looking for a Skoda Yeti, Perth drivers should contact us here at Skoda Perth. We have an impressive selection of both new and used for sale, including the new Skoda Yeti. We would like you to join us for a no obligation test drive at your earliest convenience. If you require financing, our rates are very competitive, and repayments are tailored to your circumstances. Our sales team can advise you on the latest Skoda Yeti for sale price and answer any other questions you may have.